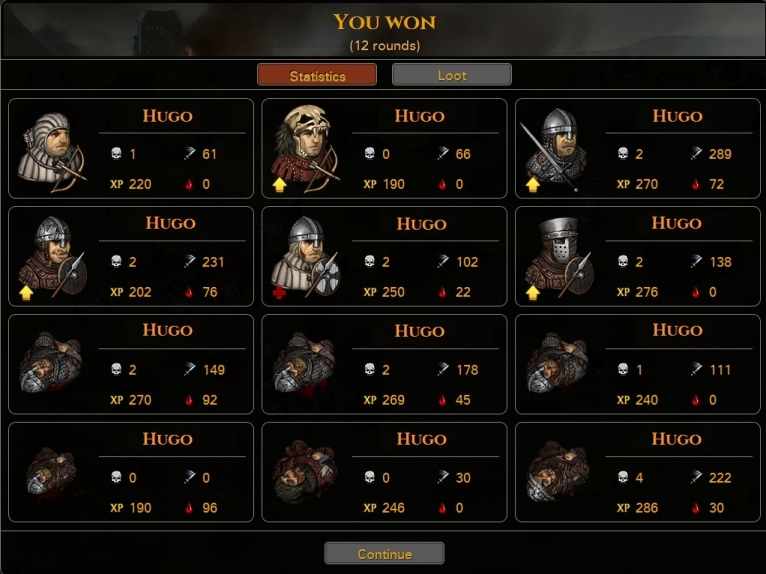 Battle Brothers launched into Early Access just about a week ago and so far it has been quite a ride! First of all, a big thank you to all who have supported us by buying the game, giving feedback and suggestions, and reporting bugs! Please keep it up and keep spreading the word and help us getting people to know about Battle Brothers! It’s now possible to upgrade your game to the Supporter Edition directly on Steam if you’ve enjoyed yourself playing the game and want to further support the development of Battle Brothers. During the past week we were busy mainly with answering questions and fixing the most urgent of bugs. Nevertheless, we managed to squeeze in some smaller balancing changes and quality-of-life improvements based on your requests. Now that the dust of the launch is slowly settling we’ll soon change our focus again on adding new features to the game. We’ll soon start working on our first new feature: The event system. While traveling the world a lot of unforeseen things can happen and surprise you. These events can occur anytime and anyplace and will force you to make tough decisions outside combat. Just to give you random example of what might be; if there is a Battle Brother with a criminal background in your mercenary company, a passing guard patrol might recognize that character and demand you hand him over as a prisoner or face the consequences. Similarly, individual characters in your group might interact depending on their backgrounds and traits – will the adventurous noble get along with the lazy sluggard beggar? Events like this will not be entirely random but depend on what happens in the world and which characters are in your company. Their outcomes will be partially randomized for the sake of replayability. The possibilities for creating interesting, challenging and morally ambiguous events are limitless. The event system is also much more than just the events themselves. It lays the foundation for a dialogue system that allows the player to interact with all parties on the worldmap like caravans or patrols. This will open up a lot of opportunities to create interesting encounters and make the player feel a lot more like a part of the world. Depending on how the event system works out, the whole contract system may also see a complete overhaul in the future to make for something more engaging than the current wall of text. At this point it’s difficult to estimate how long it will take to get the event system into the game so we won’t give an ETA here. Make sure to follow our developer’s blog to always get the latest updates and we will tell you about our weekly progress. Kudos for how you’ve been handling Early Access so far! Very responsive and quick bug fixing. Also encouraging to see the level of polish already present in the game. Game is really scratching that old X-COM itch. “may Hugo be with you”, just won the internet. That’s the ultimate catchphrase for this game. Great to hear from you! Keep up the good work, noble sires. I’m sorry to see you lost Hugo. Though, on the plus side, Hugo seems to have held his own rather well. Hugo was obviously deadweight, though. Sounds good. Hope you are also satisfied with the sales-side of the launch and that it gives you optimism for the future of the game. One thing about the random events you mention. I never played it, but I recall reading a lot of frustration by people in the comment section of The Banner Saga about too much randomness in some events which would rob them of valuable members of their party, without really hinting what the right choice or course of action would have been to avoid it. Basically, that it just randomly punishes the player just when he/she thought things were going well. Something to be careful about, not to make the same mistakes they did. I bought the game, but am waiting patiently until the final product hits. I’m a perfectionist like that! Hope the Early Access release will do great for you guys! So nothing of new content soon? Patience… the game still has about a years development left. I think the devs will drop a detailed roadmap once they’ve finalised the final vision they have for the game following the feedback we’ve given. I expect a smaller patch before the events content drops. Probably the Goblin faction, because if I’m correct they nearly made it into the EA launch version. Hehe, you have to be a little more patient. It’s only been 10 days since the EA launch. Prior to the launch we were completey busy with organizational stuff, playtesting and bug fixing, so no content was produced there. Now after EA launch we have been completely busy with bug fixing, patching, more organizational stuff (getting press coverage etc) and gathering feedback. I’d appreciate feature list to come up. It’ll help showing what is yet to come for the game. dont say EA even when you mean Early Access you could scare people off ;). So far i like the dofficulty of the game but there really should be an IRONMODE i hate that it is possible to save thats not for real men! i want more gore and blood and scream and violence its a mercenary game. i love your design and the faces of the soldiers really nice. even how the orcs work allrdy and the direction you go warms my heart so i bought a supporters pack right away. im scared of orcs, make me scream in fear pls! i love your game! keep up the great work! – WHERE ARE THE WOMEN!!! -limps off (losing a shield arm would be fascinating trash that guy or keep him cause hes a solid loyal soldier? !